Today we’d like to introduce you to Janice Lovitt. Janice, please share your story with us. How did you get to where you are today? During our 10 years in business, we started off Cleaning Blinds & Window Shades, then we added on Repairing Blinds & Window Shades, then we added on Cleaning Drapery, and then due to high demand for our company, we added on Selling Blinds, Window Shades, Shutters, Sheers & Drapery! So now our company is the “One-Stop-Shop” for ALL of your window treatment needs! We are the “Go-To People” for Blinds & Drapery! Not only do we service Chicago & ALL of the Chicagoland Areas… we also services parts of IN & WI. We also have customers from ALL over the US & they ship us their blinds for cleaning & repairing. We are also Eco-Green Blinds & Drapery Cleaners….we do NOT use chemicals…ONLY Eco-Green Solutions! So our cleaning process is the safest around! We offer In-Home & Off-Site Cleaning Services, so we can clean your dirty blinds & dirty drapery, right inside of your home! There is A LOT more about our company that helps our customers every day of the year! We are the best at what we do! It has been a long 10 years in business. First of all, there are NO companies out there that train you for this line of work, so we are 100% self-taught. Also when we started this business, my husband lost a lot of money due to his major car accident (accident was on I-55 & Rt. 83) Therefore we started this business with just enough money to buying our first Blind Cleaning Machine. (Ultrasonic Blind Cleaner) We had no choice but to do everything ourselves & work over 80 hours a week, even while I was pregnant with my first baby. Money was always an issue & our services are so labor intense that it takes a lot of time, hard work & effort to help just one customer. Also my husband has gone through so many surgeries & he is always in pain 24/7. So I am raising 2 kids & helping my husband through his injuries + working 80+ hours a week. Finding the right employees is always hard. This is a very hard business & we are cleaning very dirty blinds, shades & drapery all day + repairing very broken blinds & window shades. We are always getting our hands dirty & not a lot of people are willing to do what we do for a living. The hardest part is….getting people to know that we exist. Most people know about; carpet cleaning, window washing, maid services…..but MOST people have NEVER heard about Blind Cleaning companies & they do NOT know that we can repair their broken & expensive blinds & window shades for a very low price. Please tell us about Lovitt Blinds & Drapery. Lovitt blinds & drapery now has 2 store locations! 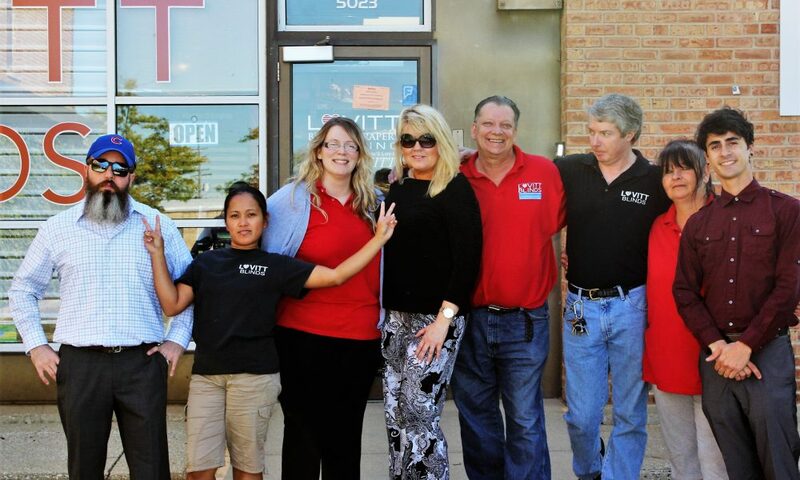 (Downers grove & Northbrook) we are a family business that focuses on customer service & window treatments! We take great pride, knowing that we are the “go to people” in the Chicago & Chicagoland area for custom window treatments, blind cleaning service, blind repair service & drapery cleaning service! We are a certified & exclusive hunter Douglas showroom dealer offering custom blinds and shades, shutters and sheers! We clean over 20,000 blinds & window shades per year. We repair over 10,000 broken blinds & window shades per year. We clean over 10,000 sets of drapery per year. Buy One Blind & Get One Blind 50% OFF + Promotions! We Are A Hunter Douglas Certified Dealer. We Are Certified & Eco-Green Cleaners. We Can Fix Broken Cords & Broken Parts. Mini Blinds, Honeycomb Shades, Pleated Shades, Vertical Blinds, Silhouette Shades, Luminette Sheers, Shutters, Wood Blinds, Faux Wood Blinds, Venetian Blinds, Roman Shades, Vignette Shades, Pirouette Shades, Woven Wood Blinds, Roller Shades, Remote Control PowerView Blinds & Shades, AND MORE!!! Lovitt Blinds & Drapery is your local resource for your interior design needs, including window coverings from Hunter Douglas. Count on the knowledgeable and friendly professionals at Lovitt Blinds & Drapery, to coordinate your decorating project from start to finish. Our distinctive services include professional measuring, experienced installation, and stylish design advice, all provided with a local flair since we’re independently owned and operated. Lovitt Blinds & Drapery has proudly served Chicago & ALL of the Chicagoland areas since 2007. In Chicago, it was always Michael Jordan & going to Downtown Chicago & wanting to grow up and help people & run my own business!